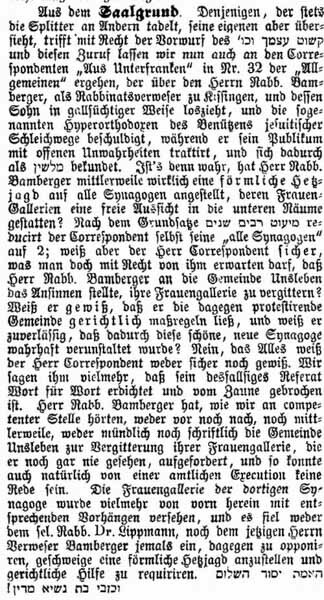 Articles in “Allgemeine Zeitung of Judaism” of 7 August 1838. 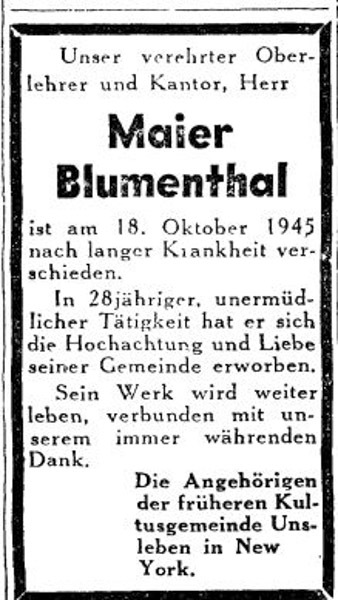 Note: Maier (Meier) Blumenthal is the son of the teacher Lazarus Blumenthal born in Laudenbach on Mainon March 26, 1876. 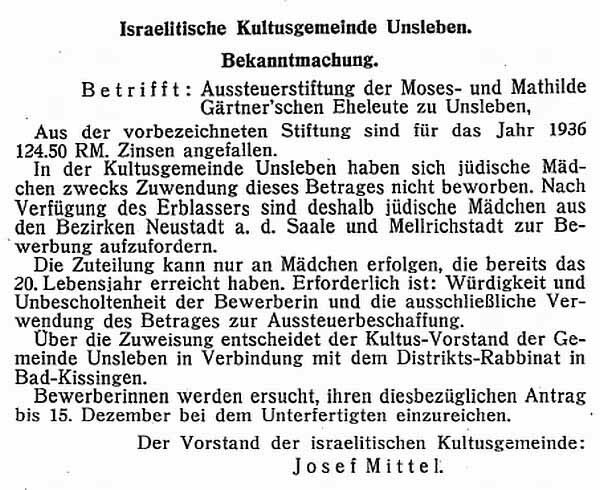 He settled on the Israelite Lehrerbildungsanstalt in Würzburg for teachers trained (Exam 1895) and was from 1906 Religion / elementary school teacher in Unsleben (previously probably in Poppenlauer ). He was married to Selma nee Lehmann (born 1880 in Wenkheim). The end of 1935 he moved to Würzburg. He emigrated with his wife, in December 1939 in the USA (New York), where he died on 18th October 1945. 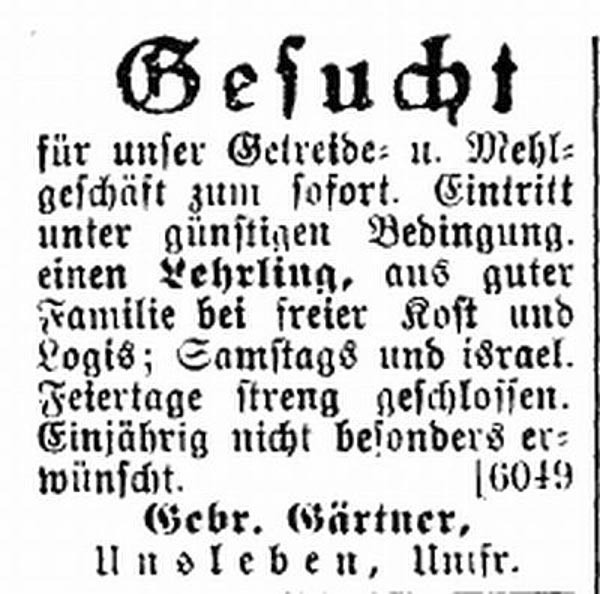 Article in the magazine “The Israelite” of 9 September (1920). 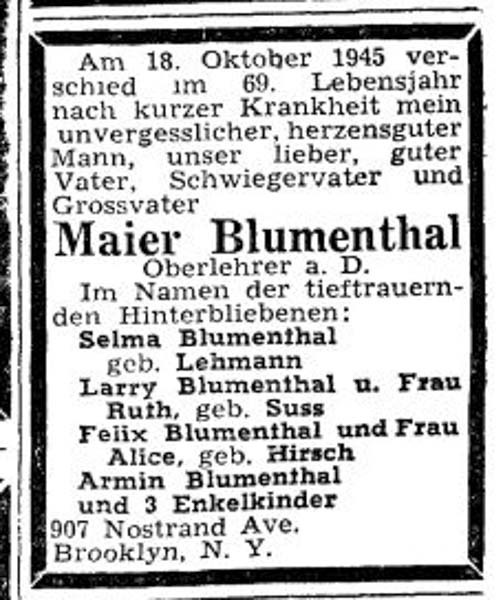 “Unsleben, August 12 The Israelite schoolteacher M. Blumenthal was promoted by the government to head teacher and with effect from 1 April 1920 from the VIII content group. classifiable “. Armin Blumenthal and 3 grandchildren. 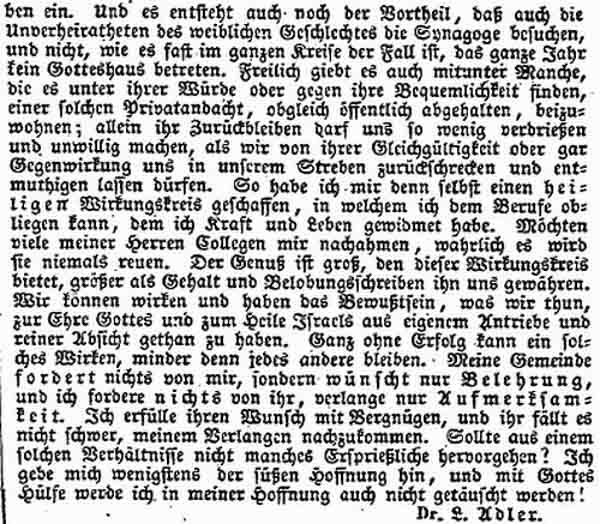 Note: This report was prepared by Dr. Lazarus Adler (born November 10, 1810 in Unsleben, died January 5, 1886 in Wiesbaden.). 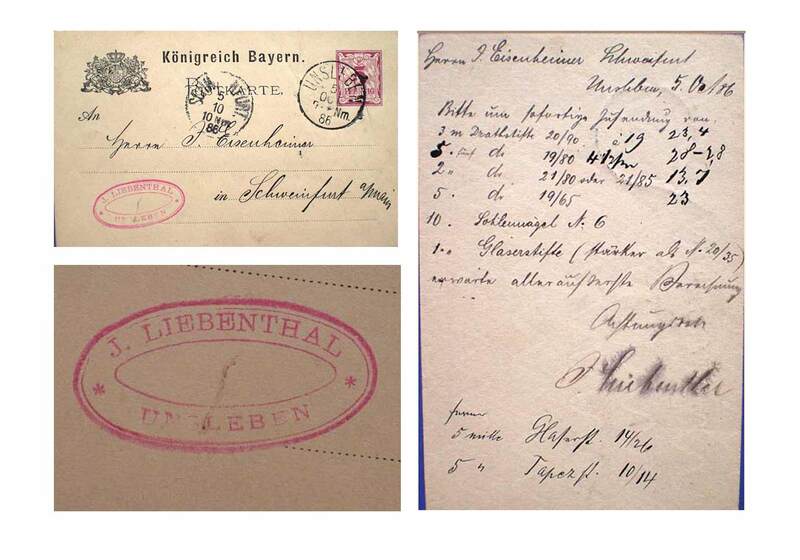 Dr. Adler was in the 1830s assistant of his father – Rabbi Naphtali Hirsch Adler – in Unsleben (he was for several years not appointing a rabbi; 1838 he was a co-signer “Munich Petition” of 17 jobless Rabbinatskandidaten); Dr. Adler was since 1840 rabbi district Bad Kissingen , 1852-1884 Country rabbi in Kassel. 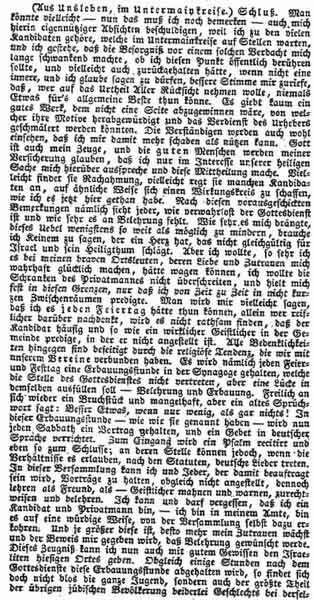 Articles in “Allgemeine Zeitung of Judaism” of 2 September 1837 “(From Unsleben, in Untermain circles) Mr. Editor When not enough to praise tendency of your hand I may assume that you not only such historical events and actions.! which promise significant success and are generally important, but also those which have fewer episodes, but none stand out less than encouraging signs of advanced education, to grant reception. even your readers, I believe, will not hear aspirations without pleasure, which is since giving known where one is entitled not to be expected. Maybe the way is also likely that what I tell you here have the pleasure to be not entirely unsuccessful and in many ways to improve Jewish relations beneficial. for six months there namely in the local not very large Jewish rural community an ‘Israelite charity’, the level of observation in its double tendency and worthy of emulation is (Note: It is this way in Untermain circles not the only or even the first. For a long time there is already a similar (but only in one direction) to Werneck, launched by Mr W. Kohn there). There live here hardly 40 families, and of course also the number of the club members should not be serious. The same counted at its birth 30 members, of which but since then emigrated to America 2. The tendency of the association is, as I said, a double, a civic and religious. In his first tendency, the association will set up a fund to be for whatever poor youths supported when they are too poor to learn the craft, to which they have tendency; or a lack of resources to go to the wandering, or also the necessary hand tools to create itself. Incidentally, the club acknowledges these uses only a preference, but does not exclude other boons, and sick or otherwise unhappy can see per the articles support. Also, not only on the local site, the effectiveness of the association is limited, but also Foreign can apply for it; as well as Foreign can enter as members of the same. That this would happen is much to be desired, and also would have also no great fruits to promise at least for a long time. As in the course of this short time the number of members has been reduced by emigration, so it stands before an even greater reduction in the coming years. Our youth are too many difficulties in establishing themselves in the way, and since the association, other than a few individuals, composed of unmarried individuals, but of these many, relief expecting to emigrate to North America itself obliged to, so he might, if not, Incidentally we hope in our country even facilitate the Israelites, many of its members lose. But the association of support without being required by external contributions. So small is the number of parishioners, so weak are their financial circumstances, and are only small contributions that can take them to their weak forces. And I can not help the desire and please express that but my fellow believers want to give some participation this, the general well-ordained institution! Truly, gifts, as they are not respected by many, would make this already important services, giving it life and strength. I know that there are currently no lack of noble-minded and charitable men, not men that bring a great sacrifice itself is not shy when it comes the salvation of Israel. Would this it not cleave beneath their dignity and for too fussy to support this institution, whether through donations or by regular contributions! The editors will certainly have the goodness, every contribution that would not be sent directly here to accept and deliver Teams (Note: we are very happy to agree to this, the editors.) With this. 12. more bourgeois tendency to promote the learning of crafts among Israelites, is now also a religious connected, and in order to be able to appreciate properly, we need to say a few words about the ecclesiastical affairs of the Israelites in Untermain circles. We are in fact in the whole circle, with the exception of some regional courts, which form the district Aschaffenburg, without any, or at least as good as without rabbis. Although this applies literally only a part, while the other is under a rabbi; Only the difference is due only to the fact that they must remunerates one, but those need to remunerates also no. Have from a rabbi, if indeed this means something, than that a rabbi oversees worship and schools, conducts and improved that a rabbi teaches, warns and cautions may, as is well known – the whole circle, with the exception of that district, no his language. Of the nearly 18,000 Jewish souls who live in the Lower Main circuits, likely about 1500-2000 in the true sense have a rabbi. The remaining 16,000, say sixteen thousand Jewish souls are in the exercise of worship, such as the teaching of religion, only abandoned. The latter is indeed provided by audited Jewish religion teachers, which are formed in the seminar. Only one bears in mind that the seminar itself (as well as in all hierländischen Jewish educational institutions) in the Jewish religion itself no instruction is given. But the teacher has yet to know a little more than the religious book of Alex. Beer to have learned by heart to be able to more than just some passages translate and analyze. But more is that religion concerning, in the tests, as far as I know, not before. Here, however, other objects because the marks are counted do occur, and so is quite possible that the Wagschalen maintain balance, even though the pound of religion is not full importance. We are not meant to want to make the Royal Government hereby reproach.Nothing could be more unfair than this. Had no ecclesiastical authority because, as takes and the Royal Government would provide such a remedy, and certainly the evil able; but it’s a because, only that it does nothing, nothing can afford. The accusation can thus only the rabbi or the municipalities, ie the Israelites of Lower Main circuit itself. The rabbi, he is no longer true now certainly because he justify his age and health conditions. But the communities have long since if them religion is not indifferent object report must pay over the state of affairs of the government, and will seek to fill the Rabbinatsstellen. What good is it if candidates do this as often and made more so pure intent, they will always be suspected that only the desire for an office were speaking of them, and not easy to find faith and hearing. But, as it stands now, who are the community’s belief that the teachers do their duty and provide sufficient religious instruction? What guarantee them whether the religion which they teach, also Jewish is? who protects them, that not many teachers disciples Präparandenlehrers are the Lord Stern to Heidingsfeld? 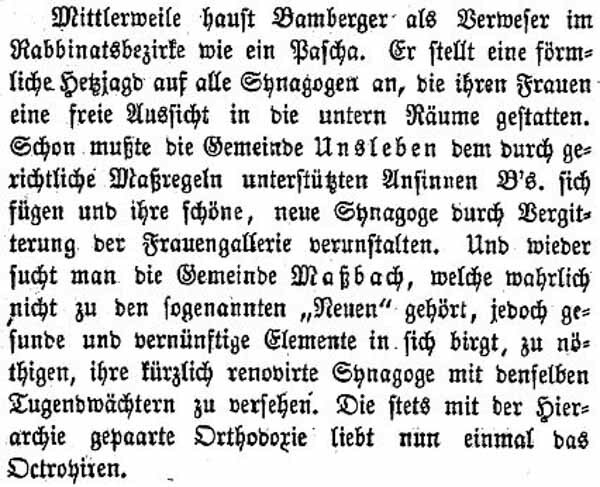 (Note: As is known, this addition has recognized the Trinity as a doctrine of Judaism in a letter to the Jewish theologians now that he himself is still a teacher, so we do not know whether his Präparanden teach in his sense). But we come to far from our object from, or I’m already so far off that I must ask the reader to excuse. But who should at the slightest touch of a field do not get lost on it, which is covered so completely undeveloped and wild, because not even a surfaced path shows up? Or, to speak without a picture, which Israelite in Untermain circles, which is a matter of indifference for his religion is not and only now and then think about it, should not be so full of it that he sees to speak at every opportunity which led to? ” (conclusion follows). 13. 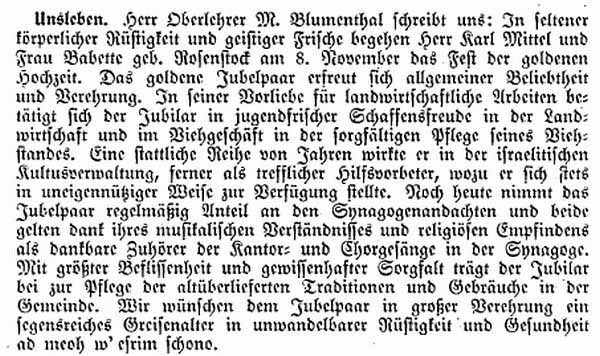 Articles in “Allgemeine Zeitung of Judaism” of 16 September 1837 (from Unsleben, in Untermain circles.) Circuit. One might – now that I have to remark – even accuse me herein selfish intentions, because I am one of the many candidates who wait in Untermain circles on site, and I confess that the apprehension of such suspected me long swaying made whether I should touch this point publicly, and might have also retained, if not an inner, and I believe I may say, better voice zuriefe me that, who would take on the judgment Aller consideration, never something could be done for the public good. There is hardly a good work, which would not wrest a side from which degraded their motives and the merit of the author could be diminished. The wise will also see well that I hurt myself, more than can avail. God is my witness also, and the good people of my insurance believe that only in the interest of our holy cause I express myself about this and make this communication. Maybe she finds imitation, perhaps it stimulates some candidates to provide a similar manner to a sphere, as I have now done it here. After these remarks sent ahead namely everyone sees as neglected is the service and how much it lacks policy. How much it urged me to mitigate this evil at least as far as possible, I need to say None who has a heart that is not indifferent beats for Israel and his sanctuary. But I wanted so much I at my good local people whose love and confidence make me truly happy, could ill afford to, I did not exceed the bounds of the private man, and held me in these boundaries, only that I from time to time preached in not short intervals. You will perhaps tell me that I would have it every holiday can do alone who think careful about it, it will not be that advisable that the candidate often and as a real priest in the church preaching, in which he is not employed. All scruples, however, are eliminated by the religious trend that we have connected to our teams. It all holidays and feast Namely held a devotional hour in the synagogue, which does not take the place of worship, but to fill a gap in the same – instruction and edification. Of course, to back a fragment and flawed, but an old saying goes: Better something, if only slightly, than nothing! In this edification hour – as we called it – every Sabbath will be held a lecture. and a prayer in German done. To input a psalm is recited and also to the close, in their place, however, can, if the conditions allow it, according to the articles, contact German songs. In this meeting, I and everyone who will be tasked can we to give lectures, although not employed, but to teach as a friend, as a – priest admonish and warn, admonish and teach. I can not and must remember that I am a candidate and a private citizen – I’m in my office, am a dignified way, chosen by the Assembly itself to. And the bigger it is, the more my confidence grows and the proof is given to me, that policy was wanted. This testimony I can now also be with a clear conscience the Israelites local map. Although a few hours after the church services this edification hour will be held, so not only the entire youth, but also most of the remaining Jewish population found but both sexes at the same. In the following article, Dr. Adler describes the situation of the Jewish rural communities in view, among other things with regard to the then existing large financial burden, which also led, that in many communities no Jewish elementary schools were founded. “Rejoinder in No. 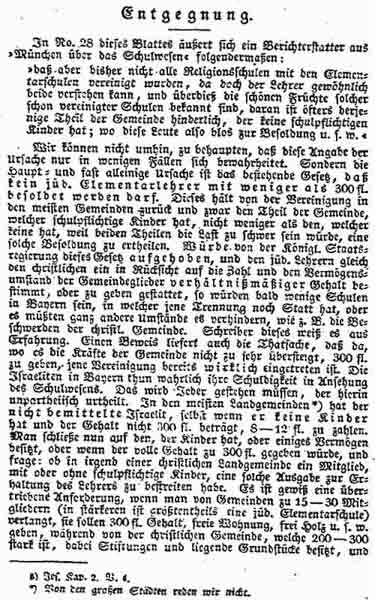 28 of this newspaper expresses a reporter from ‘Munich on the school system’ as follows: ‘that so far not all religious schools were combined with the elementary schools, seeing that the teacher can usually understand both, and also know the beautiful fruits of such already united schools, it is often the part of the municipality of hindrance that has no school-age children, so these people and so merely to grade ‘. 16. brings the yield as village clerk in stop, the teacher – only 250 guilders, sometimes more, sometimes refers less than content. To illustrate what has been said, I take the liberty, for example the local community (Unsleben) to lead, which, incidentally, has an elementary school, which is why the accusation of partiality or self-interest can not hit me. In this, which does not count much more than 40 families, and must maintain a united and elementary religious school, it is the father who is 1,000 guilders rich, and has no school-age children, more than 15 florins; to the one who is penniless and only as much earned as he needs, but one or two children of school age has, not less. They are mostly, and are they all artisans and farmers, as are their Christian neighbors; while they have also charges for Education, Cultural Affairs and poor box, while still controlling and payable protection money to a great extent; while leaving build a schoolhouse, etc. Then you can have, I believe, make a hinlänglichen term as not indifference for the school is quite as many other municipalities, especially if it is one of only 10:20 Family members, refuses take a teacher who must be remunerated with three hundred guilders. So much for the correction of cited statement. I am, however, come again to speak on this subject, so I may be permitted to add to my brethren, a few words to add draw the attention of noble and good men on a point of well deserved attention. From the above it is clear already how oppressive is the location of most of the Jewish communities in the country, and how difficult it them fall to deny the issue, which they need to make before they even get to their domestic use. But this is in reality far sadder than I indicated here, and when – what we incidentally confidently still hope in Bavaria during this long day – not soon to an improvement in our conditions, it is highly deplorable. From all communities migrate from people and make them even poorer in members and money. But if, as we are entitled to expect from the justice of our King and the humanity of our estates in Bavaria, an improvement in our relations or even an equality comes to us. as well the evil is reduced by much, but are not completely lifted. Is still the position of the Jewish families and especially in the country, except for some few rich, be a highly deplorable. When the Jewish hand recruiters and economist expending a considerable sum, which is not up to his Christian neighbor, with which it operates the same business; how can he can still exist and get along next to this? Now let us take additional difficulty that, in some countries at a time purely hope is taken to equality again, like so that they carry away even their bourgeois pressure and continue to tolerate under bourgeois limitations: so this initiative is enough to think it, at least as far as our Nine Lives, poor co-religionists to procure on its own or by way of law relief. This could happen if a spread Support Association for Jewish worship and Jewish school would set up, headed, of course, the first men would put under Israel. It seems many perhaps fantastic, but just think about it calmly, and the possibility of execution, as the wholesomeness of his work will doubt no more. It can here my intention is not to design a detailed plan or to undergo a formal request; I satisfy myself for now, to have indicated it, in the hope that a man of reputation and talent will take care of further implementation. Perhaps Sir editor of this newspaper should even feel prompted. Display of cheese wholesale-business J. Liebenthal (1890). 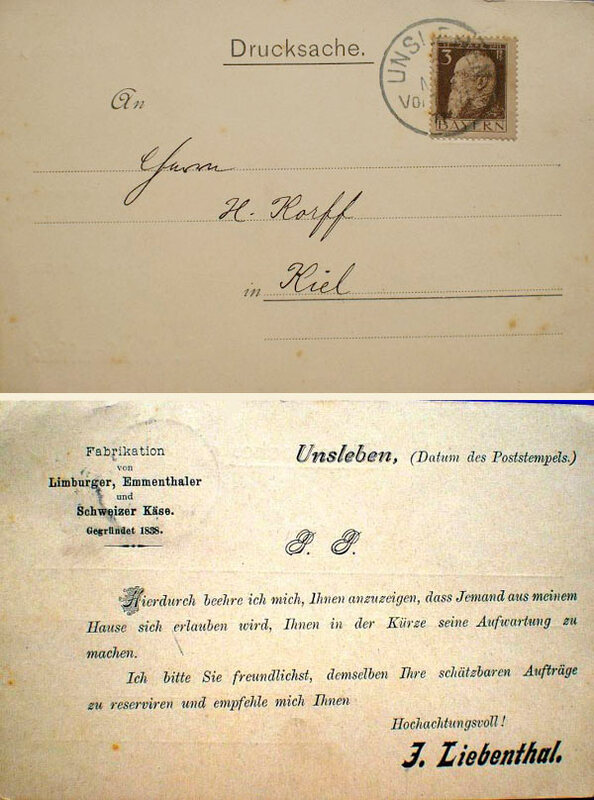 The card was sent on 3 November 1911 by Unsleben to Kiel. 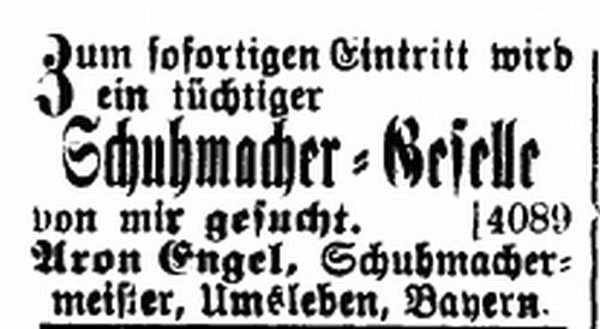 It enumerates the former range ( “Fabrication of Limburger, Emmenthal and Swiss cheese”) and the year the company was founded ( “established in 1838”). 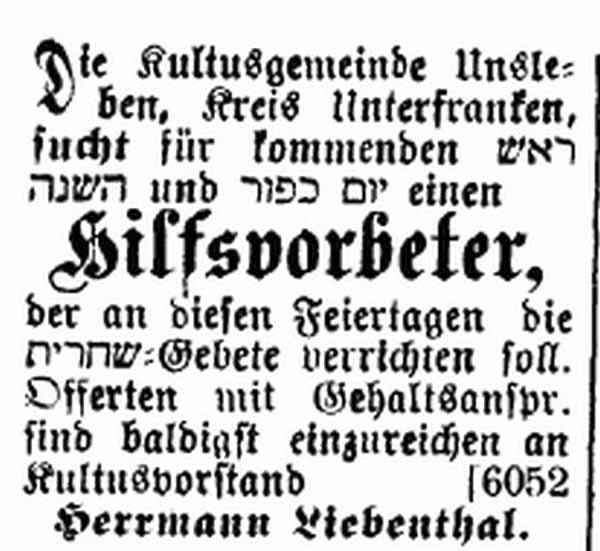 Advertisement in the magazine “The Israelite” of 13 August 1900: “Wanted for our grain and flour business for immediate entry under favourable conditions an apprentice, from a good family with free board and lodging; Saturdays and Israelite Holidays strictly closed .Annual not particularly desirable. Gebrüder gardener Unsleben, lower Franconia. 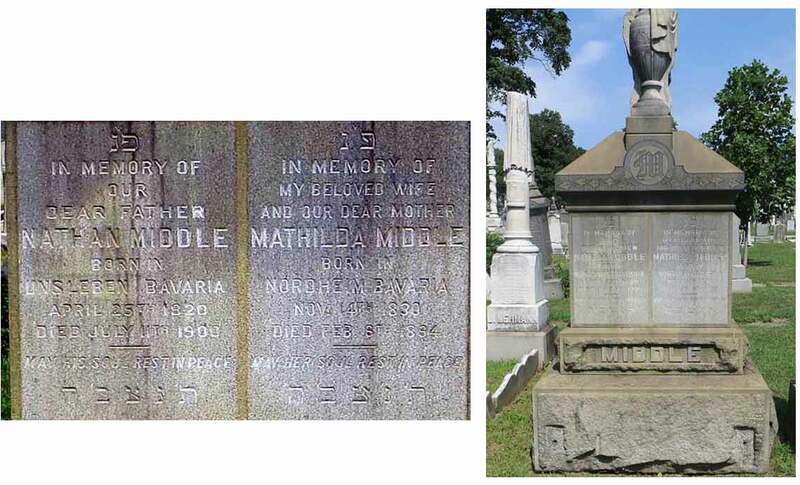 Note: the grave is located in a Jewish cemetery in NY-Brooklyn; the birth name of Nathan and Mathilda middleware are not communicated.